Click on one of the thumbnails to see all of Lea's images. 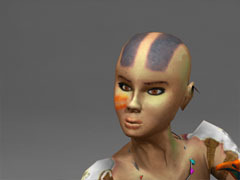 Lea is one of the two comic-style characters of the science fiction fighting game Agôn. The project was part of my education at the Berlin Games Academy. The eleven of us – three game designers, three programmers and five artists – aimed at bringing a high-quality fighting game to the PC. At the beginnging of our second semester a fellow student came up with the idea of a sequel to the 1990 sports game Speedball 2: Brutal Deluxe. We decided to not just make a 3D version of this 2D game but also enhance it with features like Internet play and items that change the characters' abilities. However, we realised that the scope of this game with its many characters, arenas, the necessary animations and sound was more than eleven students could accomplish in a timely manner. We concentrated on a smaller part of our game design, namely close combat. That way the futuristic sports game transformed into a fighting game. And with the Tekken and Dead or Alive series of fighting games in mind we had a clear vision of what to achieve: a fast, fun and good-looking two-player game. To simplify the process of animating we put a considerable effort into skinning and rigging our models. For example in Lea's rig I included an IK/FK switch, a feature that ensures smooth transition between Inverse and Forward Kinematics for both the arms and the legs. Imagine a game between two players. A duel. One of them throws his opponent to the floor. When animating the character's arms in this scene you probably start with FK. As soon as your character grabs his opponent IK would be appropriate. You would attach an IK handle to the opponent's chest and your character's arms would animate correctly. We used Autodesk Maya to create our assets and Maya's default way of handling this situation is to apply either 100 % IK or no IK at all. A boolean value, zero or one. Video of Lea doing a warm-up exercise. Don't see a video here? Flash Player 8 or higher is required. When you animate with this boolean value you clearly see when the arm switches from Forward to Inverse Kinematics unless you manually position the arm very closely. It can be done but it may become a tedious task. The trick is the IK/FK switch. For example for an arm you don't just create a single joint chain; you create three. One for Forward Kinematics, one for Inverse Kinematics and one that is influenced by the other two via orient contraints. To actually choose how much IK and FK influence the third arm you can create a custom attribute to be used via Maya's Channel Box. For a character in a fighting game an IK/FK switch for the arms can be all you need. However, we wanted the switch for Lea's legs, too. Optional Forward Kinematics for the legs was an essential help for Capoeira-style animations where one or both legs left the ground. Apart from the IK/FK switch the rig features various part for which we use secondary motion, i.e. motion that is triggered by another motion. Lea's earrings, her belt, breasts and the ornamental feathers at her wrists can all be animated. That way from a spinning kick to a swift jab all moves look more realistic than with just the body and limbs being animated. More about Lea: Maya project, video and wallpaper.